Straightening naturally curly or wavy hair will actually help to switch-up your looks and hair can actually be straighten-up using some of the best hair straighteners / hair-chemicals while at home. However, you will need to keep your hair flattened overnight inorder to maintain a great look during the day. On the other hand, there are also other ways that you can actually use to straighten your wavy/curly hair overnight without using damaging-methods like flat-irons and chemicals. So, in this post I’m going to provide you with some of the methods that you use to straighten and maintain hair while at home. Begin with damp-hair: you will need to get your hair wet before straightening it because it’s easier to comb hair and straighten it out while it’s still wet. So, go to the shower and wash your hair with a conditioning-shampoo or try spraying some water over your hair before you start straightening it. On the other hand, if you’re going to wash your in the bathroom, then consider using a conditioning-shampoo containing smoothing-agents like argan inorder to prepare your hair for proper straightening. Comb-out your hair: afterwards, you will have to comb-out your hair using a wide-toothed comb or hair-brush inorder to get rid of any knots/tangles. In fact, you need to be very gentle when combing your hair and begin by combing hair at the bottom (roots) while gradually moving downwards to the hair-tips inorder to remove any remaining tangles. Apply a good hair-oil to your hair: you will also need to apply a small-amount of hair-oil into your palms and then distribute this oil throughout your hair. This will actually help to lock-in moisture into hair but avoid using water-based moisturizers because they can make your hair become curly or wavy again. On the other hand, thoroughly massage the oil into the bottom-half of hair because this section-of-hair contains less natural-oil that can protect it. Lastly, some of the natural oils you may apply to your hair before styling it include; tea-tree oil, argan-oil and other good hair-oils. Section-up your hair: start by creating a middle-part within your hair using a hair comb/brush. 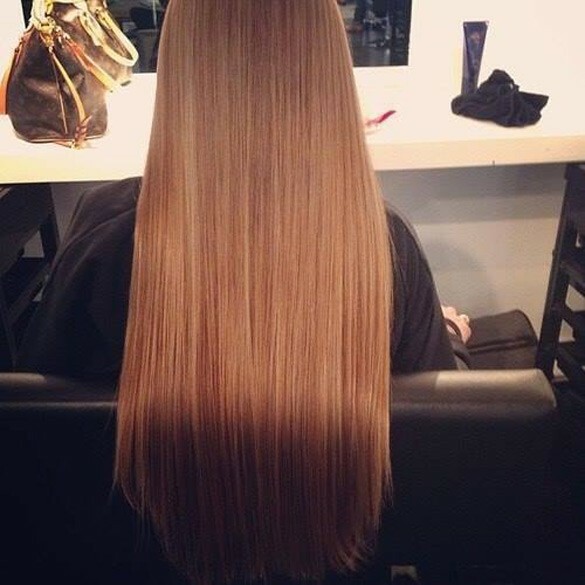 In fact, you should begin sectioning hair at the front and then work your way towards the back-section. Afterwards, brush one-half of hair over to one-side and behind the ear and then brush the other remaining section-of-hair around the back of the neck and over the opposite-shoulder. Wrap the created sections-of-hair around the head: start by taking the top section-of-hair and then comb it over to the other side of your head. In fact, you should hold the base of this section-of-hair downwards using your palm inorder to prevent a wave or bump from forming at the base of the comb/brush. Comb the ends of hair around the back-section of your ear and around the back of the neck. Continue working in small-section until all the hair is combed-over and around ears and neck. Brush-down each section-of-hair: get a bristle-brush and then comb over each section because this help to hair stick-together and even lie flatter over your head. In fact, having your hair lay tight and flat over the head is the key to achieving straighter hair. On the other hand, make sure that you hold the top section-of-hair down using your palm inorder to prevent bumps from developing. Use a hair-clip to hold each section down: you have to use a duck-bill clip to hold each section-of-hair downwards and this will even help to make it easier to comb over the bottom-half section of longer-hair. Afterwards, you will need to comb the bottom-half section-of-hair over the top of your head and then use a duck-bill clip to secure it. Consider smoothing your hair continuously using a bristle-brush inorder to keep all the sections-of-hair blended. Wrap all hair using a scarf inorder to keep it into place: get a silk or satin scarf and then wrap it over your hair inorder to keep it place. Afterwards, place a bonnet or wig-cap over the scarf inorder to hold the styled hair firmly together. In fact, this will help to prevent hair from unwrapping while sleeping. Remove the wig-cap and scarf in the morning: you will have to gently remove the wig-cap and scarf form your hair in the morning and then gently unwrap hair while undoing one-layer at a time. In fact, your hair will look straight after unwrapping but you may need to gently comb through it a little bit inorder to completely straighten it. Wash or spray your hair with some water: you will have to start by either taking a shower or spraying your hair with water. So, use a good-conditioning-shampoo to wash your hair and if you don’t take a shower and decide to just spray hair with water then make sure it’s conditioned well before styling it. All in all, wet-hair hair is easier to brush and straighten than dry-hair. Comb through hair using a wide-toothed comb/brush: gently comb hair inorder to remove any tangles and knots. Additionally, make sure that hair combed-out straight and long as possible just before you start styling it. Divide hair into 2-sections: divide your hair into 2-sections by simply creating a middle part and then let the hair fall on both sides of your head. In fact, you should make sure that the created part is straight and both the hair-sections are lying flat against the head. Secure hair into 2 low-ponytails: you will need to fasten your hair into 2 low-ponytails while using soft elastic hair-bands. However, avoid over-tightening the elastic-bands because this will create noticeable indentations within your hair. On the other hand, avoid using regular uncovered rubber-bands to secure the ponytails because such elastic-bands can easily get caught into hair and cause tangles/knots. Afterwards, gently comb out the bottom-section of each ponytail inorder to make straight again. Add extra hair elastic-bands down the length of each ponytail: consider adding one hair elastic-band every inch inorder to hold the ponytail together and to keep the combed-hair straight overnight. Remove the elastic-hair-bands in the morning: when you wake-up in the morning, carefully remove the elastic-bands from hair and then comb hair out using a wide-toothed brush inorder to smoothen it. However, avoid making hair damp again because this will make it curl again and you may finish by applying a hair-oil like tea-tree or argan-oil inorder to add moisture to and extra-shine to your straight hair.